1. For the onion compote, melt the butter in a large saucepan over a low medium heat, add the onion, garlic, thyme leaves and star anise. Cook for 1 hour, stirring occasionally until well caramelised and dark in colour. If the onions start to catch on the bottom of the pan, add a little water and stir more frequently. 2. Meanwhile, coat the bottom of a frying pan with a thin layer of oil and place over a medium heat. Add the bacon lardons and cook for 4-5 minutes until the bacon is soft and beginning to colour. Drain the bacon on kitchen paper and set aside. Deglaze the pan (with the onion compote) with the Madeira, white wine and white wine vinegar, and cook for a further 5 minutes. Add the bacon and season with salt and freshly ground black pepper. Remove the star anise and allow to cool. 3. Preheat the oven to 190°C, gas mark 5. Unroll the pastry and cut out 4 circles using a 9.5cm cutter and place 2 on a baking tray, brush with egg approximately 2cm from the edge. Using a smaller 8.5cm cutter, cut a disc out from the centre of the remaining 2 discs, and discard the centres. Place the pastry rings on top of the circles on the tray and bake for 12 minutes or until fully cooked and golden brown. Remove from the oven and place on a cooling rack until completely cool. 4. Spoon 40g of the onion compote inside each of the cooked pastry tarts, then crumble 20g of goats cheese into each with an optional few drops of Marmite, if using. Return the tart to the preheated oven for 8-10 minutes. 5. Meanwhile, prepare the vinaigrette by mixing the vinegar and mustard in a bowl, add the oil and whisking continuously. Mix some of the vinaigrette with the mixed salad leaves, add the peppers and season. 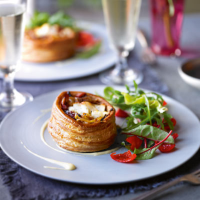 Divide the mixed salad in half and place on a plate next to the warm onion and goat’s cheese tarts.